Use the power of nature to help eliminate parasites in every stage of life. Use for tapeworm infections, pinworms & other parasite infections and intestinal worms. Made with wormwood, black walnut, cranberry, garlic, pumpkin seed & 11 other natural remedies for parasites. Order VitaStrength Parasite Cleanse Today! FREE SHIPPING via Priority Mail. Receive it in 1-3 days. 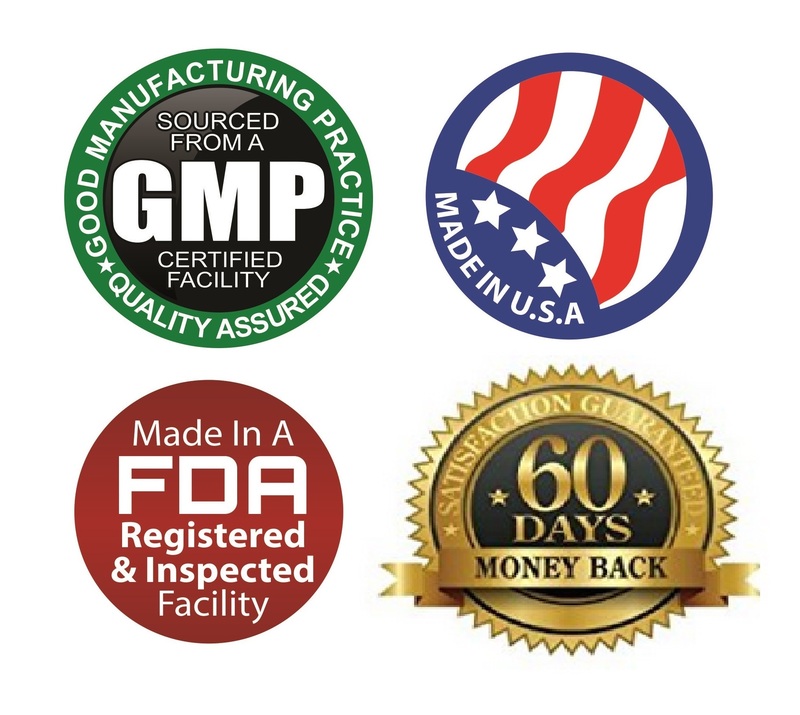 TRULY NATURAL INTESTINE CLEANSE (NON-GMO): Unlike other parasite cleanse products, our detox formula truly is naturally derived with no dangerous chemicals or hidden drugs like mebendazole. HIGHLY EFFECTIVE: Use the power of nature to help eliminate parasites in every stage of life. Use for tapeworm infections, pinworms & other parasite infections and intestinal worms. MULTI-STAGE: Our herbs have been shown to have the ability to kill parasites at every stage of the life cycle to eliminate adults, larvae and eggs with one simple detox cleanse. TRULY NATURAL: We don’t hide chemicals or dangerous drugs in our herbal remedy for intestinal worms. GENTLE: Our formula is free of stimulants and simple to digest. CONVENIENT: Just 2 capsules 3 times per day is all that it takes. You’d need to swallow dozens of pills to get the benefits of our 16 herbs otherwise! Promote digestive health the natural way with the finest blend of intestinal cleanse herbs on the market today! Order VitaStrength Parasite Cleanse now and get 60 of our easy-to-use, all natural detox capsules. As an asian race i have always ate street foods because i love to eat them. Now i am not scared anymore because i have this product already. I know that it helps all the bacteria cleaned in my stomach. Even my husband. Sometimes he has this everyday sickness. He has to burp very loud and i know that he is acidic. But i let hin try this and now he burps very seldom. I am happy to this product. My son is using this because our dog had worms and we didn’t realize he had contracted them from her… He is only on day 4 of the regiment but we have already seen improvement in his stools… Who knew humans could contract worms from their pets? Either way I am glad VitaStrength had this Parasite Cleanse and Detox to help us out with this problem.. I recently had my gallbladder removed and have had issues with constipation. So i thought i would try the cleanse. I felt some gently movement as the pills started to work. I did not have any side effects as i had with other things i had tried. after a few days i felt lighter and had more energy. I have even lost 4 lbs the first few days and that’s all way a plus. i would recommend this to anyone looking to feel less sluggish and looking for some relief. This was a product that I thought I would never need to try, however, My lovely three and four year old daughters passed along their Ring Worm to dear old Mommy and Daddy and we have tried just about everything we could, including some prescriptions from the doctor in order to get rid of it. When I saw this product, I knew that I had to try it! Great news, is that I had no ill symptoms from it (which I was really worried since it does say Detox, and I had absolutely no desire (none, nada, zilch) in sitting on the toilet for hours on end because it upset my stomach). When I hear the words Detox and / or cleanse, I usually want to steer VERY clear of that product. This was kind of a last resort, and boy am I glad that I tried it! Within a few days, my little “circle” mark on my body caused by the ringworm was disappearing. This was like the best news in the world to me, as I was completely utterly exhausted of ointments and other medications to rid myself of this little pest. It states that it is unsafe for Children, however I think I may try and take it to their doctor and see what he thinks since it is natural ingredients that make up this product. All in all, I would say that if you are looking to cleanse yourself of a known or unknown parasite, I would start with this product. You will receive info from the Seller that will also be beneficial to you as well. The shipping packaging was a very nice packaging that kept the product well taken care of so that you didn’t have to worry with anything happening during transit. The customer service from this seller & after sales care was brilliant and would make me buy from them again. I had no problems from ordering to receiving my item. Delivery was fast and trouble free. Wow! I honestly was a tad skeptical when I first starting taking these. 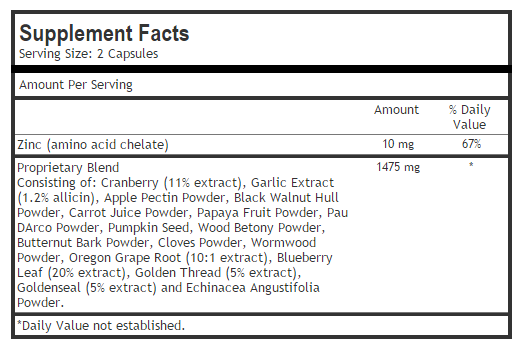 I have taken cleanse tablets in the past and was wondering if I would have the same results. So forewarning you… this post will have some things that others consider TMI. But if you are reading this part of you wants to know this information anyway. I am very pleased with results. Instructions say to take 2 capsules taken 3 times a day preferably with meals for 10 days. They are easy to swallow and no strange after taste at all. I am pretty regular when it comes to my bowel movements but this has changed some things for me. It is really cleaning me out. I do feel more energy. I know that all feces stinks but while on this product I really stink. Honestly, the foulness is beyond anything that I have ever smelled that has come out of my body and there is a lot of it! I have lost a couple of pounds and I have also noticed that my appetite has changed and I am not as hungry as I usually am. I am half way through the recommended time and I already feel so different! Wish I had know this product existed before. I received this product Thursday evening. My wife and I each too the recommend dose. The first day we had a little bit of gas but nothing bad. today we can feel it working. The product does not make it to where you have to live near a bathroom. After the first day it seams to make things a bit more regular but not horrible. we were both able to work and not be uncomfortable. If you suffer from stomach issues this product is a good product for you. I have numerous health issues and so does my wife. neither of us have had pain or diarrhea. since we started it. You also will not have problems using the bathroom. This really works. The fact is that every single one of us are exposed to parasites & from the air we breathe….the water we drink & the food we eat. This cleanse was super easy to do although the first two days are a little rough but you really start to feel good! I felt like I was able to sleep better after about four days I had more energy throughout the day & all in all I felt a little less bloated. Overall I just feel cleansed from the inside & I love the feeling. I’m sure you will too. I had these pills for about a week before I tried them. I didn’t really want to cleanse over the holidays, but I really had no choice and finally just went for it. I finished my 10 day cleanse just yesterday. These absolutely 100% worked for me. They didn’t cause cramps, but I didn’t venture far from a bathroom for the entire 10 days. I feel so much better now. I look forward to starting my 2016 healthier and feeling better. This Premium Parasite Cleanse came well packaged and on time. Detoxing the bod is important to me. Getting rid of potential parasites is even bigger. as much as we travel we always fear acquiring a parasite or worm. This will help in reducing that fear. The product came fast and was well packaged. The product was exactly how it was described. You take two…three times daily with food for ten days.I have taken this for a couple of days and I already feel better. It’s good for your immune system and it gets rid of parasites in your body that can make you feel bad and bloated.It also improves your intestinal health. I had a lot of problems when I would have bowl movements and it was a constant problem . It was worse than have a bad case of diarrhea for a month and someone I no told me to try this . Oh I cant even begin to tell you how much this helped and im back to going regularly now. My energy level has increased. I noticed that my bloating has decreased and my bowel movements has become regular. It comes with 60 easy to swallow capsules. I recommend this product and will be purchasing more in the future. I got these because I took my cat to the vet and was told that he had worms – and cats are notorious for spreading parasites to humans so I decided just to do a little cleansing myself. The pills are an ok size and do not leave a nasty taste in your mouth. They do their job well, you will have about 20 minutes of taking them before you get the signal that you need to move. Warning, you may get cramps the first couple of days. Upon (basic) inspection, I did not find anything unusual. I did however, notice that I had less irritibility (gas or loose stools) and more regulation to my poop cycle afterward. I would use this again. This is a good intestine detox. Not only does this detox your body like many other detox but this one also gets rid of parasites. We would not know what we pick up or where when we live our day to day lives especially if we travel out side of the US and go to places such as Africa and mexico. We can not wash our hands every time we come in contact with nasty things no matter how much we would like. Having pets and cleaning up after them can also put us at a higher risk of contracting a parasite. These pills where easy to take. I had no side effects and no after taste. They shipped quick and the price is good. I didn’t have to be in the bathroom all day either. This is a great parasite cleanse! The pills aren’t massive like some and it works quite quickly. I took 2 pills a day and by the second day it was doing exactly as it was supposed to. It was not explosive like some other cleanses are but a very easy on your body with minimal cramping and such. I would highly recommend this for anyone who wants to cleanse their body and check for parasites as it was one of the best cleanses I have ever used! The pills are quite small, easily swallowed, and have no bitter aftertaste. I have experienced no negative side effects from this supplement. The main thing I have noticed since taking this parasite cleanse is less irritability. Irritability is something I experience on a weekly basis, along with gastrointestinal upset if I go long periods without eating. I have read that this could be parasites. I decided to try this detox in the hopes that it might help. It has helped with both of these issues, although the gastrointestinal upset is still not completely gone. I plan to do another parasite detox to finish off anything that might remain. I will update if/when there are any changes. One side effect to mention is an overall feeling of malaise the first couple of days. This did subside and I have read this is the detoxing taking place. This isn’t terribly strong but it has a good blend of ingredients, especially walnut hull powder, that’s one of the better ingredients. I don’t have parasites or a problem with them but I thought this might be interesting to try. Most of the ingredients are really good for the digestive system and the immune system. They are all proven to kill parasites. By all means, take probiotics to keep the gut biome in balance after taking these. 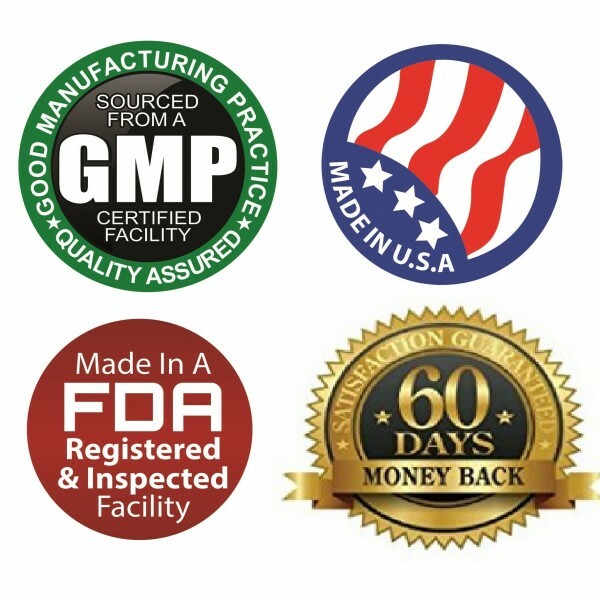 I recommend giving this a try, the manufacturer has a great return policy 60 days. Very good cleansing and detox product. I felt the effects the 1st day. I feel that my body is becoming less toxic and I am definitely less bloated. So far I am very happy with my results and look forward to seeing my end results when I finish the bottle. I will be purchasing another bottle in the springtime to cleanse again. The Holidays left me exhausted, sluggish, irritable and drained. I over ate all the wrong foods and by the time Christmas came and went I was in desperate need of a detox. I’ve been taking these for almost 2 weeks now along with a clean diet and after about 3 days I noticed I had more energy for a longer time. I’ve also lost 1 pound so far and I feel like these pills have cleared out my system allowing me to be able to have better weight loss success this year! One of the reasons I ordered this particular product was because of the natural and familiar name ingredients that it contains. The pills are a little bigger than I would like but go down fine. There is no aftertaste. I have not seen any negative effects from them and assume they are doing the job if needed since I feel the ingredients contained in the pill are very important for a cleanse. 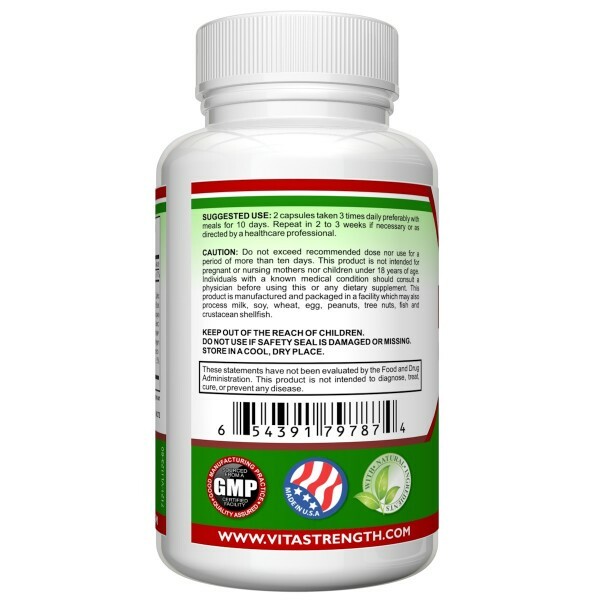 I feel good about taking this product mainly due to the natural ingredients the pills contain. I’m not sure if I had/have any parasites, but I had been having some of the symptoms ie…teeth grinding, fatigue, distended belly, sweet cravings….so I decided, after reading so many good reviews, to try this parasite cleanse. I’m a little over a week in, and let me tell you…if there were any parasites they’re gone now! I believe this detox is pulling toxins from my SOUL….lol…I’ve had several “bathroom visits” but they aren’t runny like diarrhea. When I have to go…there’s ALOT though. I started to feel more fatigued, and was having cramps in my stomach, & lower back after being on this detox for a few days, but that seems to have subsided. Now I feel more energetic. I got off work this morning, and instead of feeling sluggish as usual I felt energized. There’s a noticeable difference in my belly size…1 of my coworkers mentioned that lastnight! As I’ve stated before I’ve been taking the detox a little over a week, but I’m taking it faithfully..so I’m going to finish the bottle. 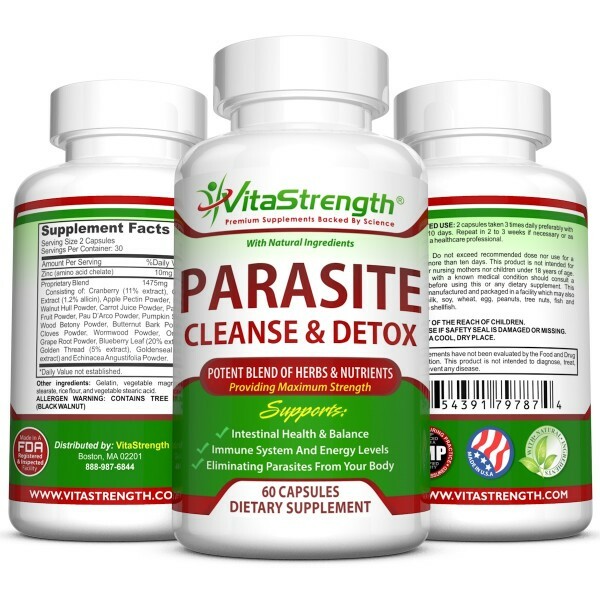 I would definitely recommend the Vitastrength Parasite Detox. My husband and I had both done a parasite cleanse about six months ago after reading how many people it affects. I was discussing this with my son a few weeks ago who stated that he would like to try a parasite cleanse himself. I began looking for a product for him when I came across this product. This product has been better than expected! My son started taking these immediately upon their arrival. Despite the fact that he experienced some extra flatulence, he stated that he felt much better, even by day two. He didn’t feel as tired as he had been and was able to focus better. By day three is when he started to actually see results. He came to me and told me he saw things in the toilet that weren’t typical. He was kind of grossed out but relieved these were actually working! The best part about these pills is that he didn’t experience any garlic burps like my husband and I had. He also didn’t go through​ any die off period symptoms. Just immediate results and that includes feeling like a new person! I highly recommend these to everyone! If you haven’t done a parasite cleanse before I suggest you do and these are a perfect choice for effective results! I finished the bottle this morning. Day 2-3, I felt exhausted and irritable. I started improving after that. I noticed on day 7 that I am not sluggish, even after work in the evenings ( in the middle of winter…., Wow) I did not search for parasites, but did notice a difference in my stool on day 2-9. Day 10 was back to normal. I am glad I did this cleanse and will order again! – I feel more energetic, even almost 2 months after finishing treatment. – My hair looks and feels healthier. It appears to be growing faster. – I have asthma and prior to treatment I needed my rescue inhaler multiple times a week – since starting the treatment (almost 2 months ago) I have only used my rescue inhaler once. I do not want to give anyone false hope as this could very well be a coincidence, but the timing is strong enough for me to believe it is true. I am giving a truly unbiased review, I have been dealing with this problem for over almost 2 years. I have tried humaworm with just a little relief, Dr. Clark which did help some, but not completely. Along with several other products that did not help at all, this is the first one that has done what it claimed. I have just started my second order fingers crossed it will eliminate the remaining parasites. GREAT PRODUCT! Ok, this isn’t going to be one of those cute reviews where I act all lady like and say I used it for a detox but never checked to see if it worked. It’s about to get real right now! First off I’ve never, nope not even once, in my 31 years ever did a parasite cleanse. I’ve detoxed before but that was for weight issues so did juice or green smoothie cleanses. Honestly, I don’t think that does much for parasites, possibly even feeds them…who knows! Anyways, upon receiving this product, I had this idea that IF I didn’t see anything weird or odd in my dainty toilet treasures, then how would I know if this worked. So yes, part of me WANTED to find something but then again I didn’t even know if I had a parasite so, I mean you can’t make something appear that was never there..unless your a magician and in which case I would think you would refrain from doing such a thing to poo poo! Anyways, I’m sitting here today on day three and it’s either my freaked out state of mind or I actually saw something I now want to unsee. Problem is I never get this up close and personal with my flushable trinkets so is this normal??? I do not know. What I can tell you is I’m grossed out! I saw these little white specks, almost like sesame seeds…but I didn’t even eat any sesame seeds. I took this to Google and why oh why, do they give you the worst possible senario and nastiest pictures??? So by Google searches I found out I may have had a case of Giardia, which is yes in fact a parasite. Now here’s where it gets creepy…. I have a cat and it’s thrown up rather nasty hair balls with these same dots and this parasite is known to transfer from animals to humans. Are you grossed out yet? I am! Now, I am definitely going to finish out this entire 10 days as directed but beings I’m on day three, Im really grossed out. I’ve not done any “digging” this has all been from just visual examination of the surface of things…not even sure I’m willing to go there just yet. I certainly hope this gets it all out, I may do a repeat dose in 2-3 weeks as stated on the bottle if I feel it’s nessesary. This did not cause any stomach upset, I’ve taken it as directed 3x’s per day at the dosage of 2 capsules per dose. I actually wanted to try it out just to see what it would do, not because I had any symptoms, yet know a lot of people have parasites without knowing it and was curious about my own body health. Btw, I’m now on the lookout for a good pet parasite treatment because of this so if you do find anything, don’t forget to treat your pets especially if that’s how you contracted anything. We live on a farm in Hawaii and we raise animals. Living in Hawaii, in the tropics, means that we don’t have the advantage of cold winters that normally break the parasite cycle. So we have to de-worm our animals much more frequently on the mainland. I’m giving this history only to explain that we know a lot about internal parasites and what it takes to get rid of them. When you live in the tropics and take care of livestock, even washing and sanitizing your hands constantly, there is no way to be completely safe from getting internal parasites yourself. I started having gastrointestinal problems that indicated I might I have parasites. My first treatment was with an over-the-counter human dewormer containing the ingredient Pyrantel Pamoate, an ingredient I was familiar with because its the same ingredient we use for deworming some of our animals. The product worked. Shortly after using that product, this Premium Parasite Cleanse arrived. Any parasite medication (natural or chemical) only kills one life cycle of the parasite. That means (depending on the product) you have at LEAST one follow-up dose. I decided to skip the chemical de-wormer and use this product instead. It worked! Next time I’m skipping the chemical de-wormer and using this product right away. HOLY GOODNESS!!! Powerful stuff. Shocked but very happy with the results. WORKS! Would recommend to anyone who wants a good parasite cleanse. FRESH AND CLEAN! After writing ths review ….A variety of parasites can infect the intestinal tract. Parasitic infections have become more common with international travel over the last few years. Unfortunately but not surprisingly, they can cause a variety of symptoms, such as fatigue, constipation, diarrhea, vomiting, heartburn, chills, stomach pain or loss of appetite. If you suspect having a parasitic infection, there is a natural way to treat it. It’s called a parasite cleanse, and I strongly advise you do one as well as eat an anti-parasite diet for a period of time to heal yourself. This premium parasite cleanse is natural and truly does help you detox. You will see different items in your dooo doo. but rest assure that is is for a healthy reason. Drink lots of water .. I found that when taking this, I was very thirsty. This product is great! It works immediately. It really had me going to the bathroom all day. I feel light weight, I see a great difference in my mid-section, and I no longer get bloated. I love this product! I’ve tried every detox out there and this one by far it the best! It didn’t make me feel sick & I felt a big difference compared to other products. This detox is really good for the price! I take them at night and in the morning for a week and let me tell you it works! Depending on how bad you need a detox will effect the side effects. First time I did it I was in the bathroom frequently so be read for the OMG moment I have to go. Last time I did it, it was not bad at all since I didn’t need the detox that bad. It def. clears out your system and helped me lose some toxic weight as I call it. Great detox and way better than the others I’ve tried in the past. When I first got these pills I was a bit skeptical that they would work. Wow was I wrong! I decided to take these because I had been feeling sluggish, my digestion was all wacky, and I just felt icky. I wasn’t sure if I had parasites or not, but I could definitely use a digestive detox. I haven’t taken these for the whole 10 days but I’m very confident that they are working. I can’t wait to have my digestive system back to normal. Anyways so far so good, if you are thinking of trying these out I definitely recommend trying them. They have definitely already helped me out and I’m not even done using them yet! I have been using this and feel better knowing that if there were a parasite in my body it is not going to be there long. I like knowing that the things I put into my body are not going to do harm. This product is one of the good ones. “Maaaaan this product is STRONG. After taking only 2 doses it really got my bowels moving! It didn’t cause discomfort or anything, but I decided to cut down to half a side (one capsule instead of two) just because of my busy schedule right now….I didn’t want to have to be too close to a toilet. But I’ve found this product very effective so far. I feel like it’s balancing out my intestinal flora and I can feel it cleansing my body. Prior to taking this product I had had a slight tickle in the nether regions, a mild yeast infection, but after a couple of doses the tickle sensation had completely disappeared. I really appreciate products where I can strongly feel a difference from taking them. This one I definitely feel a difference. I do recommend Vita Strength Parasite Cleanse & Detox. 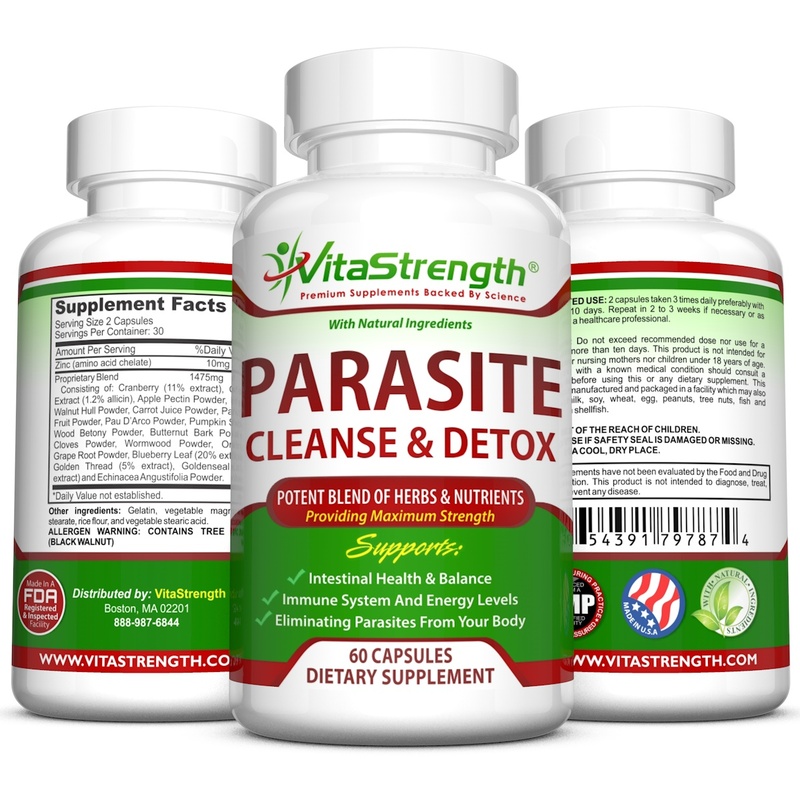 I recently heard about cleaning and detoxing parasites from our bodies with a natural cleanse like this one from Vita Strength. This is the second parasite cleanse and detox I have tried and it works wonderfully with excellent results. I had noticed a huge difference in my health prior to knowing about parasites and the systems they cause when they are thriving in our bodies. However, I’m not sure if I had any parasites but I did suffer the symptoms of sugar cravings, foggy brain, and no energy. 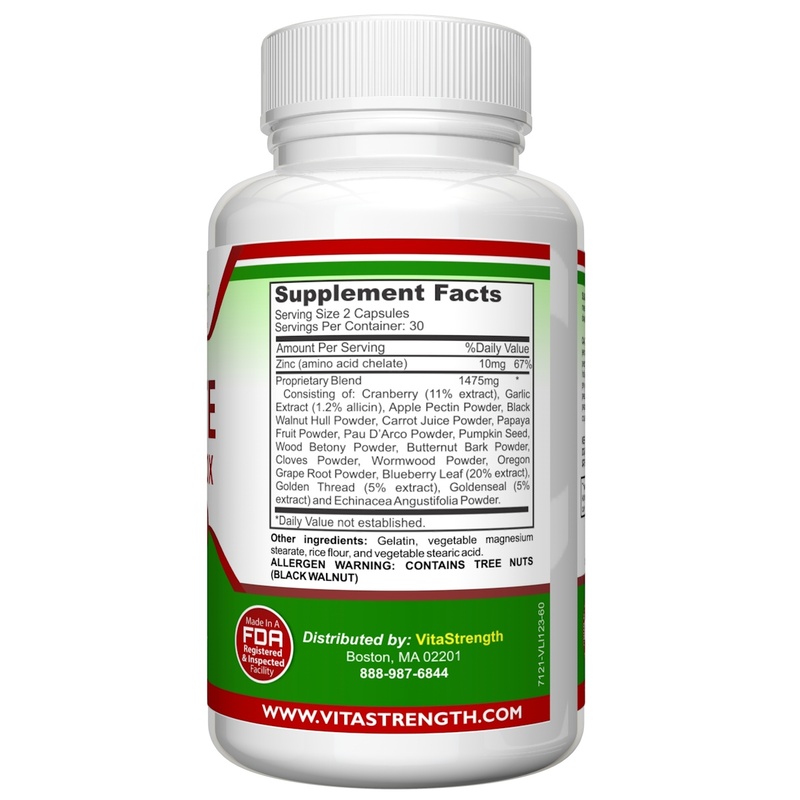 What I really liked about these supplements is I didn’t have any side effects and started to feel a difference in my system within a few days. The ingredients contained herbs with cloves, black walnut, wormwood, cranberry, garlic, pumpkin, etc that helps cleanse and detox. It’s good to detox twice a year. I’m definitely going to order more of these supplements. Love it! Parasites are much more common than you may think. You are exposed to them much more than you realize. I was concerned because I was taking care of puppies that have worms. I knew that I had been exposed to them so I wanted to do my best to ensure that my body was safe. That is exactly why I took this parasite cleanse and detox. It contains an array of effective ingredients such as black walnut, wormwood powder and much more. It is a truly natural intestine cleanse. There are no chemicals or any other frightening ingredients. It left me feeling healthy and safe. 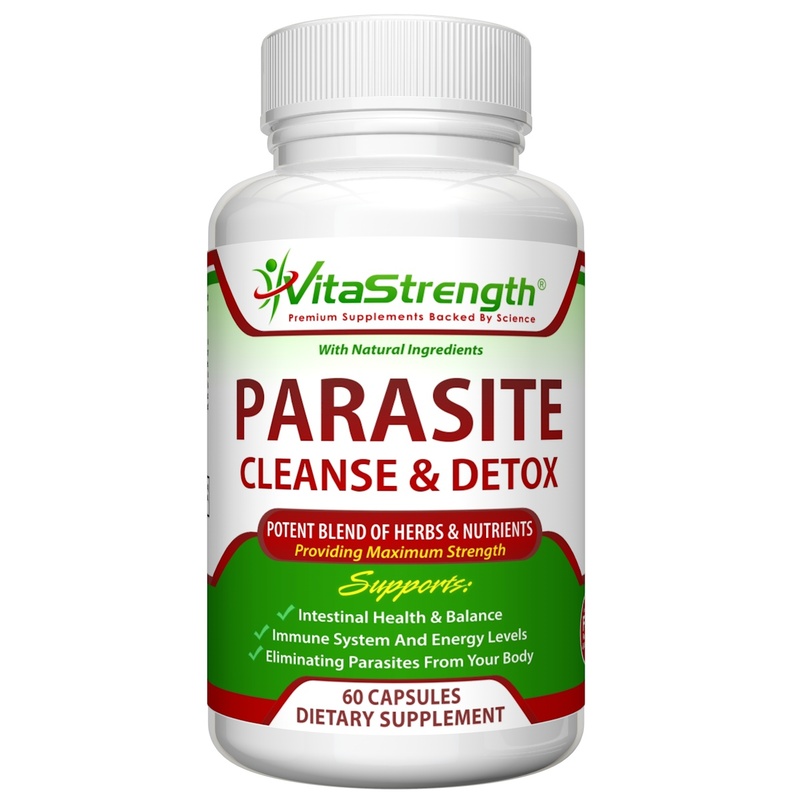 If you suspect that you have been exposed to parasites, definitely give this product a try! This product is wonderful! It works immediately so quick that I wasn’t prepared, It really had me going to the bathroom almost all day. I feel a little light weight at times but I see a great difference in my mid-section, and I no longer get bloated as much. I love this product! I used to be confused by detox but now I’m so proud of myself for using it. Some of my friends cannot believe it worked so fast for me, so now they buying it. It didn’t make me feel sick & I felt a big difference compared to other products.This detox is really good for the price! I take them at night now because I first tried in the morning but I was in the restroom so much. I have been taking these for more than a week and it works! Depending on how bad you need a detox will effect the side effects.This product is great! It works immediately. It really had me going to the bathroom all day. I feel light weight and I no longer get bloated. I love this product! Truth be told I wasn’t sure if I wanted to take this product or not. I believe it’s being blissfully ignorant. Nevertheless, I did try it, and while I didn’t see any worms I have noticed a pretty great difference in how I feel overall! I am almost done with my first bottle, and I’m pleasantly surprised at the difference in how I feel. I feel like I have more energy and my digestive system seems like it has gotten better. I do not know what this product did to me but, I feel much better than before. My stomach is lighter and digestion is faster. However, I felt a little sick first week when I started treatment. I didn’t even know if I had any parasites at all, but the only thing I noticed is that this herbal supplement gave me more energy either from cleaning or detoxifying my body. I also noticed that my skin improved and became less fatty. I really think this supplement is much better and more natural than any chemical alternative because it is made of herbs. After prompt delivery, the product appeared to be exactly as described in the ad. Having lived in rural areas my whole life and not knowing all of what I have gotten myself into, I found this to be the perfect product to make sure I am parasite free and prevent further possible buggers from infesting my body. I believe that it works and love the idea of such a natural simple fix that is low cost, as opposed to a high cost possibly life threatening issue down the road. I’m Originally from Egypt and Parasites are very common over there. I had some issues with them in the past and I got treatment. It cost money and time to find out if you have parasites or not and sometime it’s just much cheaper and easier if every once one a while you did the cleans weather you have it or not, there is not much to lose. In this case if you have Parasites you will no longer have them and if you don’t then that is great. Highly recommend this product. whenever i tell people about parasites they look at me like i am crazy. however if you are eating fast food, traveling, eating street food, have pets, etc, it is important to cleanse your body. animals get parasite treatment, humans should too. you never know when you may pick something up, and it is just multiplying in your gut, could have been years ago. slowly making you sick. this cleanse helps provide piece of mind. it also makes you go to the bathroom, which is reassuring. The capsule is pretty typical sized for a supplement. There is no after taste. I did not have any sorts of side effects other than uhm… let’s just say that I had to use a lot of air freshener after trips to the bathroom. I can only imagine that it was doing the job it is intended to although I didn’t look very hard at what the results were in the bathroom. 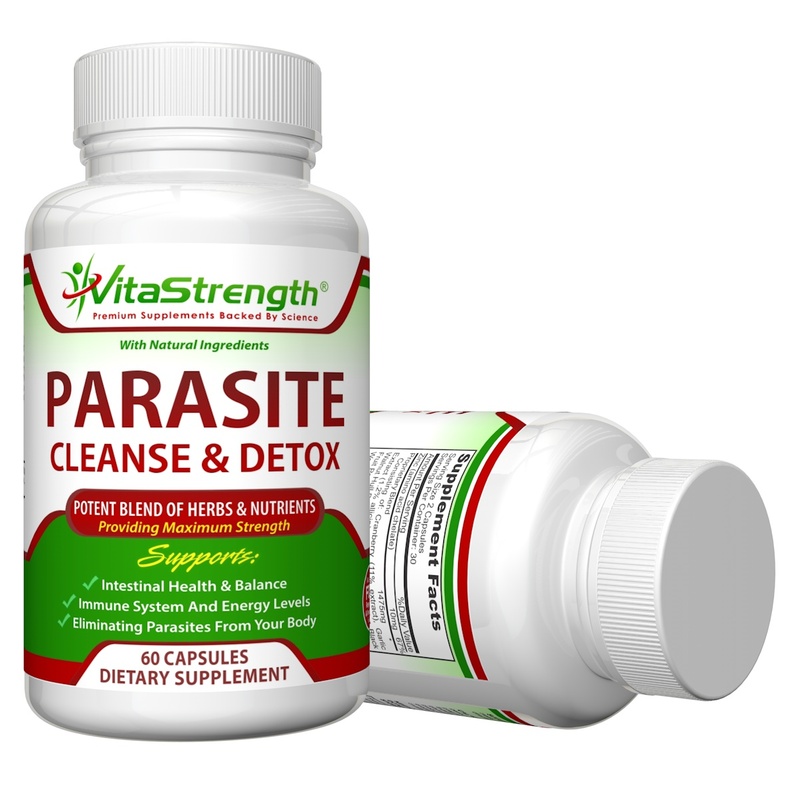 VitaStrength Parasite Cleanse is an all-natural remedy for intestinal parasites. It eliminates parasites, pinworms, tapeworms, and other intestinal worms and infections. It is supposed to kill all stages of the parasite life cycle. The first few days are rough but it is very gentle on the body and easy to take with a dosage of 2 pills 3 times a day for 10 days. This is a great detox. I’m only halfway through this cleanse, but I’m already noticing more energy and less bloating! I haven’t seen or felt any weird things, but I haven’t had any issues that I know of due to parasites. I did this as more of a preventative measure. So far, so good! Nothing too drastic, but the slight changes I’ve noticed have been positive! It feels great knowing you are taking something that is helping your body get rid of parasites that you may be hosting within your body without even knowing it. All in all, this supplement makes you feel safe with or without knowing if you actually do have parasites living in your system. Great product! Great Parasite cleanse. I gave it to my aunt to use on my cousin who had something wrong with her stomach. I do not know if she had parasites but it did clean her out and she was better within two days so it did something to help her out most definitely because she was complaining about her stomach hurting for a week before taking these. I eat sushi often so I wanted to do a parasite cleanse. They did.not make me feel yucky like a lot of pills do. I really could not even tell I was taking them. I never saw anything that looked out out of place but it never hurts to be sure. I will do a parasite cleanse once a year just in case. Quality product! I feel amazing after a week and can’t wait to feel better everyday! Definitely recommend this for anyone looking to feel better with bit of energy everyday! This product arrived on time and undammaged. These are easy to swallow and need to be taken for a week and a half and your done. I like that they are made out of all natural ingredients with no side effects. THESE WORK WELL!! I bought these for my girlfriend who was having intestinal distress, she has felt a big difference and had parasites, apparently they are very common to have! She has noticed a big difference in her overall health while taking these. Perfect Cleanse! I had never tried a parasite cleanse before. I am a few days into it and feel cleaner. This is a product I will try to take a couple of times a year now. Love this product!! I travel a lot to different parts of the world and im not scare to try street food. I’m sure i get a lot of parasites and bacteria while i eat all these foods; however, every time i return to the States I try a parasite cleanse in order to restore my system. I tried this Cleans and i was happy with the results as it did not give me stomaches or side effects. I feel like it work and will try it again after my next trip . Thanks for providing a product that when I went to the drugstore (Walgreens) could not get or did not have anyone with enough knowledge to guide me to a product. Made me a little constipated but I did see some possible worm looking things in my BMs. This is my second time cleansing. I have Irritable bowel syndrome but was worried that it could be more since I was having extremely loose bowels and weight loss even though I was eating lots of food. My belly was also bloating. I took through the course and am no longer having the disgusting symptoms. This product really works. Didn’t even have to get a costly prescription that had many other unsightly side effects.